They talked about the global game of baseball and the passion that keeps them in it and the young players—getting younger every year—whom they now steer through major-league careers. They relived past glories on O’Donnell Field and retraced the winding paths that got them where they are. They talked about rebuilding efforts and pace of play and making trades. They talked about their moms. and Ben Crockett ’02, vice president of player development for Boston’s own Red Sox. Forst (left) and Bridich discussed the responsibility they feel as "stewards" for increasingly young major-league players. 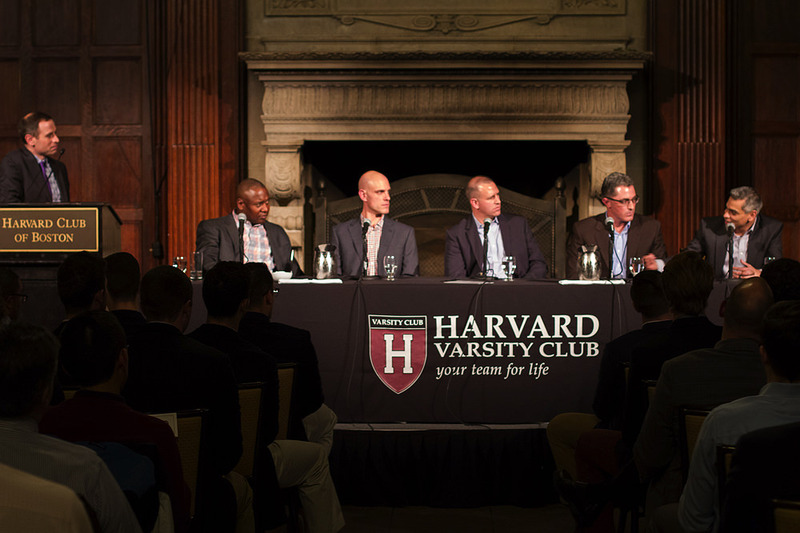 Morosi (left) and Hill shared laughs over their Harvard baseball memories and where the game has taken them. The current Crimson baseball team met privately with the panelists before the event and sat up front during the talk. And then finally, they came to moms, prompted by a question at the mic from Bridich’s father, former Crimson baseball player Rick Bridich ’73. Forst recalled how his mother—“the one who loved baseball just about as much as anybody in our house”—moved from California to Cambridge and took an apartment on DeWolfe Street during his senior season and went to every game. Crockett’s mother, who was not a fan, learned the game “completely on the fly.” Bridich remembered the undergraduate struggles his mother and father got him through, an early experience in failure that they knew would be all right, even when he did not. Edited audio of the event can be heard on the University’s Sound Cloud account.